I think this was the last ‘fan question’ video clip I did back in 2013. Well, a lot has changed since then, including me, so maybe it’s time for me to have another crack at one of these clips? Anyway, to that end stick your questions in the comments section below. When I’ve got enough I’ll do a video clip … maybe. Update: Okay, Laszlo has started off with a question in the comments, which is what I wanted people to do anyway. If you could all ask some more questions for the next video clip that’s be great. As many of you may know I have done a few video clips in which I answer fan questions. Here’s the last one I did, last year. Yes, that ugly bugger is me. I bet you didn’t realize my short story was so famous. Hur hur. Here’s the latest. As always, further questions in the comments section below. ChrisW: You’ve probably answered this before somewhere, so feel free to ignore, but, what’s up with “The Departure”(the HB not the eBook) not being available/published in the USA? Is it going the way of “The Line of Polity”? Spaceoperaghost: Will you ever expand on the story of The Quiet War? Taylor Preston: When you write, do you revise/edit as you go or do you just hammer out the first draft before you put pen to paper and start making changes? I know you’ve said before you don’t normally outline, so I’m wondering how much revision you end up doing and how you go about it. Huan: What size are Amistad and Sniper? arj209: Have you reached the lofty heights of stardom of being recognised in the streets? Friso: Your Wikipedia article mentions “runcible” is an homage to ansible. Is that how you intended it? Thezzphai: In an interview you talked about your next Polity book possibly being called “Penny Royal”. Can you already tell something about the content (pretty please) and when it will be released approximately? Are you already working on it or is it just an idea for the time being? Chrish: ‘I’m finding the writing ridiculously easy (which is worrying)’. I’m puzzled, why worrying? Okay. I watched one trailer and wasn’t convinced, but seeing this one I now know I’ve got to see this. I think John Carter of (on?) Mars was about one of the first SFF books I ever read. It was the big four-armed green bugger on the cover that attracted my attention. I was looking round for the cover picture of ‘John Carter of Mars’ which shows you how your memory plays tricks with you. 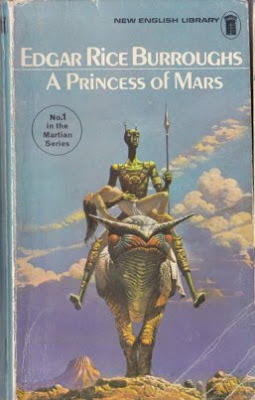 The first of these books I read was ‘A Princess of Mars’. Sent a shiver down my spine yet, oddly, I’ve never read the book. However I did hear about half of it read by the teacher of my class in junior school.